Mittlebergheim, Bas-Rhin, Alsace France Cellar Door £12.50 12% Sweet, floral nose, slightly smoky with a cherry-menthol aspect. Very thin attack, dry oak but fills out a little on the mid-palate. Pleasant, light finish with a bizarre heat at the end. Tannic edges and a touch hollow. Ribeauvillé, Haut-Rhin, Alsace France Cellar Door £18 13% Creamy nose with a mineral edge and a hint of lychee. Very dry on the mid-palate; grippy, almost tannic acidity with a lemon/lime finish. A very good, structured wine. Mittlebergheim, Bas-Rhin, Alsace France Cellar Door £18 14.5% Golden colour with a deep, oily nose. Fresh on the palate, drying as the mid-palate ends and with a glycerol coating on the finish. A hint of age in with the richness, rich but fresh. A lovely, subtle bittern finish. The nose develops a toffee component in the glass. Bergheim, Haut-Rhin, Alsace France Cellar Door £38 13% Golden colour with an old-Riesling nose; smoky, woody. Sweet attack then initially light on the mid-palate before filling out with a long, honeyed finish. A wood-smoke mid-palate. Niedermorschwihr, Haut-Rhin, Alsace France Cellar Door £45 13.5% Spritzy attack with a delicate, lightly floral nose – almost perfumed. Clean & fresh with a lime mid-palate, good complexity and an almost austere, citrusy dryness. Eguisheim, Haut-Rhin, Alsace France Cellar Door £26 13.5% Typical Gewürztraminer nose, lychees and syrup leading to expectations of richness. In the mouth the lychee is still there but it’s lean in flavour and medium dryness with a delicate finish. A very good wine, although the nose suggest a much richer, sweeter wine than the palate delivers. Ribeauvillé, Haut-Rhin, Alsace France Cellar Door £33 13.5% Sweet, floral nose with a lot of weight. Sweet attack with good complexity and structure with some Turkish Delight on the finish. The sweetness is on the cusp of overpowering the acidity and there’s no variation from attack to mid-palate and finish, so it comes across as a little one dimensional. Ribeauvillé, Haut-Rhin, Alsace France Cellar Door £30 13% Perfect acidity for the luscious sweetness, great integration. A peachy-peach wine – rich & complex. Alsace is long and thin, stretching 115 miles down the east side of the Vosges mountains between the Rhine, and Germany’s Baden region on the other side of the river. At 25 miles wide the vineyards are on the lower east and south-easterly slopes. Alsace wine is produced mostly from white grapes and there’s a strong Germanic feel to the region and the wines – the only ones in France under AOC allowed to label by varietal. Alsace dry Riesling vies with Germany and Austria for quality and Gewürztraminer in all styles is synonymous with the region. The southern Haut-Rhin ('Upper Rhine') is home to 38 of Alsace's 51 Grand Cru sites. 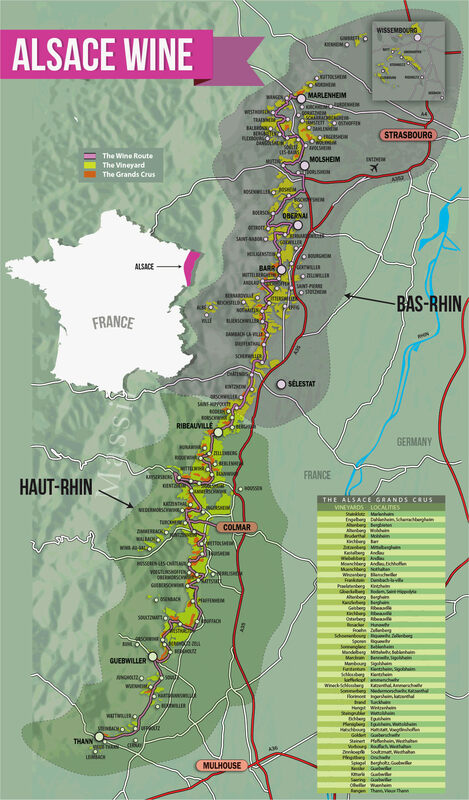 The names have no direct meaning in wine labelling, but there are terroir differences between the 2 that can translate into the wines – the Haut-Rhin has more hill slopes where the Grand Cru vineyards dominate while the Bas-Rhin is lower and flatter.